Prepare for the winter months and guard against the bitter cold with a quality thermal Slazenger Fleece for Company Freebie. 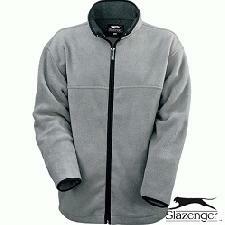 Slazenger™ make a quality 100% polyester fleece - easy to wash and dry in no time at all! With a high quality 5000 stitch area we can have your company brand name and logo printed to the finest detail, to expose and advertise your business as much as possible. Visible and noticeable to the eye! We have different options available of half zip or full length zip. Customise your logo brand name by an embroidered stitch - of upto 5000 stitches for your company logo! For a FREE QUOTE please fill in our contact form regarding our Logo Branded Slazenger Fleece and we'll be able to help you.